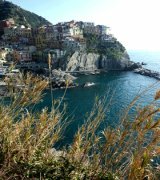 For the past several year, the hills surrounding Manarola in the Cinque Terre are the home the World's largest nativity illumination, the creation of a now retired railroad worker, Mario Andreoli. There are depictions of around 300 characters from the story of the Nativity, and gets lit up at dusk, every day from Dec 8th to early February. 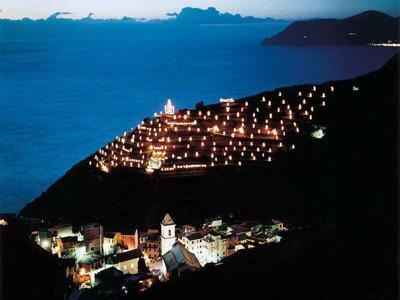 Also the 15 thousand light bulbs that lit the characters are powered by a photovoltaic system and thus the installation complies fully with the requirements of sustainability and environmental protection of the land that is characteristic of philosophy of the Cinque Terre and its National Park. Join in and write your own page! It's easy to do. How? Simply click here to return to Dec 2010 Events on LiguriaGuide.com.